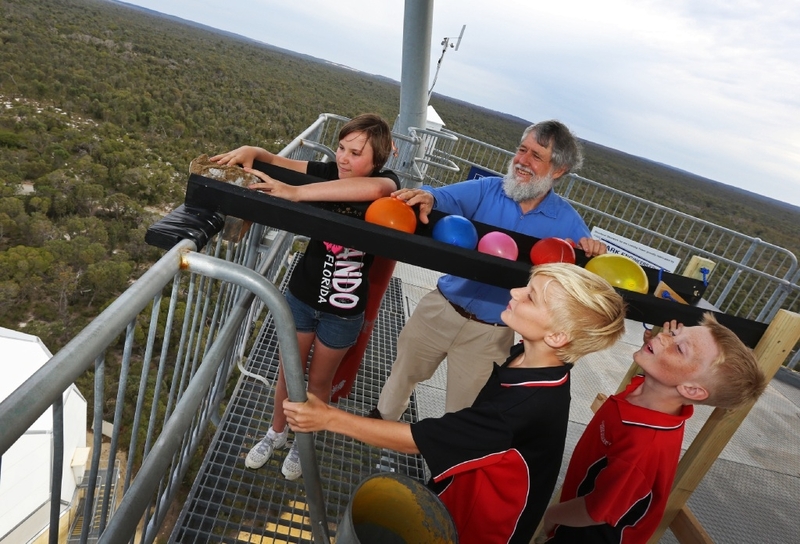 The observatory held the launch on October 27 to coincide with a rare astronomical event. Board member and UWA Professor David Blair said the supermoon rising that day coincided with the setting sun. Representing the State Government, Agricultural Region MLC Jim Chown and high school students opened the facility with a simulated comet impact exercise. Prof Blair said they launched an �icy comet� made by the students using sand, ice and liquid air to match the properties of the comets beyond Pluto. �Like real comets, it left a trail of white cloud as it crashes to the ground, and made a significant crater on impact,� he said. Prof Blair said the education facility had three new telescopes, plus WA�s largest public viewing telescope � the Brodie-Hall telescope. He said it also had a cluster of optical and radio telescopes, including WA�s largest optical one � the Falcon telescope. US Consul General Cynthia Griffin announced the addition of the Falcon, a robotic telescope developed by the US Air Force Academy for space situational awareness. �It will be able to monitor natural and man-made space debris, helping to protect the Earth and spacecraft from catastrophic collisions,� Prof Blair said. Visit here or call 9575 7577.